Who are the Amoeba Sisters? We are two amoebas who teach science. What on Earth is an amoeba? We aren't typical amoebas. 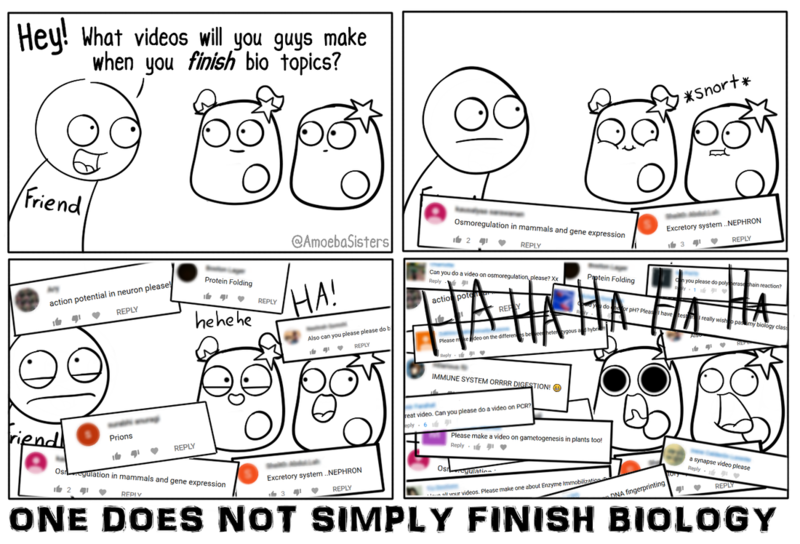 We create science YouTube videos, GIFs, comics, and resources (such as our Unlectured series). You can find all of these creations on, or linked to, this website. Our science videos on YouTube make up the bulk of our work. But who are you in real life? In our human form, we are two sisters from Texas. Petunia is the creator of the comics and GIFs. She times the comics to Pinky's audio in a movie editing program to create the videos. Petunia (arguably) has a better sense of humor than her sister counterpart. She is also passionate about gaming and using games in STEM education. Pinky writes the scripts and records her voice. She has a biology degree, a public school science teaching background, and a passion for using EdTech to involve students as creators. She is interested in science communication and closely follows the Twitter #scicomm hashtag. How come only one of you talks in the Amoeba Sisters videos? We both focus on our passions so much that Petunia prefers to practice her love of drawing and Pinky prefers to practice her love of teaching. If we switched roles, we would have to subject everyone to iguanas and silky bantam chickens illustrated by Pinky. No one wants that. ;) But...if you need proof that Petunia talks, please check out Petunia's speed draw video. In 2013, Pinky was reflecting on her time in the classroom and was looking for a way to help make the lengthy traditional lectures she was accustomed to using less...lengthy. She had observed that it was often during her traditional lectures and notes where she found her students' curiosity dwindled and more classroom management challenges arose, at least in her classroom. She mentioned this to her sister one summer evening, and the brainstorming session resulted in an idea for making a video on enzymes. You can learn more about the very beginnings of our channel here. So are you both crazy about science? Pinky has been crazy about science since the beginning of childhood. She is interested in science communication and closely follows the Twitter #scicomm hashtag. Petunia started to develop a love for science when she could make it more applicable to her. When she started drawing as a hobby and explored how to connect it to her own interests, she started to develop a curiosity for science. 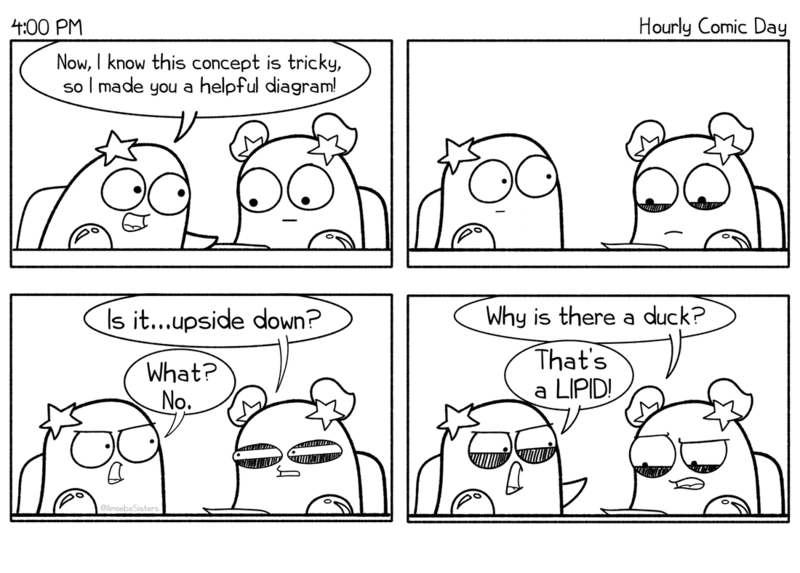 Click comic above to go to our Amoeba Sisters webtoon! Purpose. We find great purpose in demystifying science with our creations, and we love to empower teacher and student creators. Therefore, hearing that our work is helpful in education is especially motivating. We also have learned so much from others, and we have developed friendships in this journey. Pinky is not teaching in the 2018-2019 school year, but she finds social media is amazing for staying connected in science teaching. Our favorite article on this topic is by an awesome educator, John Mead. Do you have suggestions for how to best use your videos? As we've grown, our goal is that our short videos (always less than 10 minutes) can provide foundation information so that there is more time for the valuable class experiences of hands-on labs, classroom discussion, and involving students in creating! Check out our "3 Creative Ways to Use Our Edu Videos" (designed for teachers) or our "Study Tips, Motivation, and Our Biology Playlist" video (designed for students). Click to see our video above- designed for teachers. Click to see our video above- designed for students. Petunia loves cartoons, and most cartoons have main characters. We wanted that for our videos. Amoebas are amusing and super easy to draw with their blobby figure. But on that note, you really do not need to be able to draw or have any special talents to create. Petunia has no artistic training. You just have to get started. Trust us on that. We are better than we were when we started in 2013. We're life-long learning amoebas. Besides making videos, any major projects right now? Last year (2018), we finished one of our major projects, the Unlectured Series! This year (2019), we recently finished a major project: our mega review video! 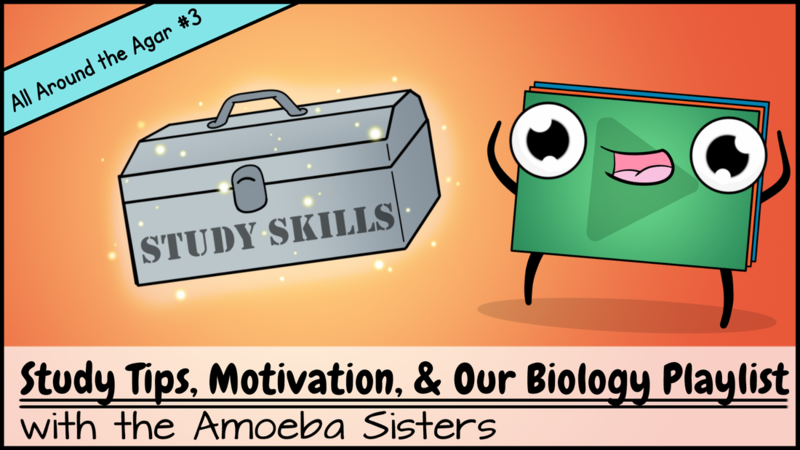 We also launched a new webtoon about our daily life called Amoeba Sisters: Sisterhood. Do you present on how teachers can create videos for their classroom? Sometimes. We are very interested in empowering both teachers and students as creators. Our presentations show strategies for involving teachers and students in video/GIF creation while maximizing valuable classroom time. What do amoebas do for fun? Do you have hobbies? 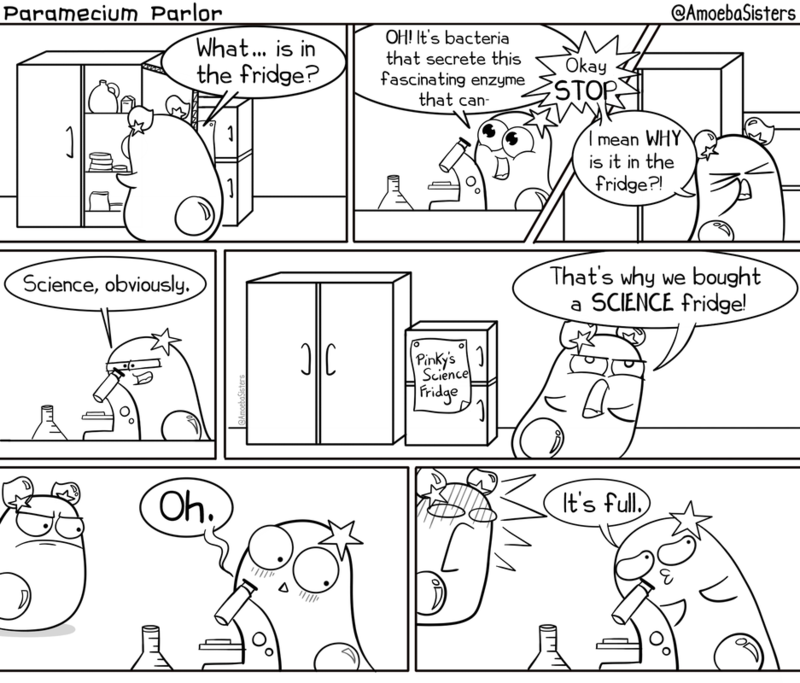 For Pinky, science is also a hobby. Pinky also loves spending time with her amoeba family, the outdoors, and running (pseudopodia) marathons. She is also working on some post-master's coursework and caring for baby #2. Petunia prefers the indoors like gaming, reading, and eating plankton. Occasionally, we are traveling amoebas. But...not that often. Besides this website, where else does your work exist? Who is Gus? I see people ask about Gus? Gus is our pet Euglena! He sometimes makes an appearance in our work. You can learn more about him here. Are you ever going to stop making protist jokes?